This is a survey on some known properties of the possible Moore graph (or graphs) ¿ with degree 57 and diameter 2. Moreover, we give some new results about it, such as the following. When we consider the distance partition of ¿ induced by a vertex subset C, the following graphs are distance-regular: The induced graph of the vertices at distance 1 from C when C is a set of 400 independent vertices; the induced graphs of the vertices at distance 2 from C when C is a vertex or an edge, and the line graph of ¿. Besides, ¿ is an edge-distance-regular graph. 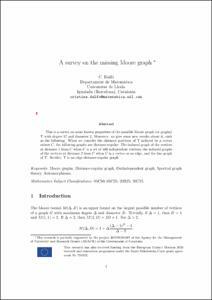 Dalfo, C. A survey on the missing Moore graph. "Linear algebra and its applications", 2019, vol. 569, p. 1-14.